1) I am not a medical doctor, just a physicist that happened to get "lucky" and found almost nothing about this on the web. The opinions are my own, based on my research. They are only opinions. 2) Every case and every patient is different. What (I hope) is working for me, may not be indicated for you. There is no substitute for seeing a doctor, but this web site should at least help you go in informed so that a fruitful discussion on options can ensue. I know that in my case, my local Ear, Nose, & Throat doctor was discussing possibilities that at the time were way over my head as I did not even know what a schwannoma was or how serious it could become. The 2nd discussion with him was much better as I had a handle on this. Providing information to people who are as "lucky" as me, is really the main purpose of this web site. At this point in my understanding of how this is called, the doctors seem to use Schwannoma and Neuroma interchangeably. 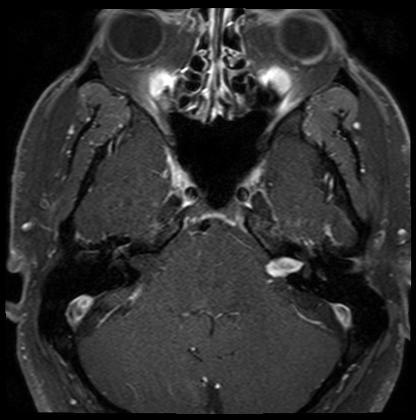 The radiologist who did the initial reading of the MRI labeled this as a schwannoma, but my Ear Nose and Throat physician called it a Neuroma. The 7th cranial nerve is also known as the facial nerve, thus the there are also two names for the nerve. Clarification from the medical community would be helpful. I will put this description in terms closer to an electrical engineer, instead of a doctor. Imagine your nerves as copper wires. Around all wires that you are familiar with is an insulator to protect and insulate the wire. Nerves have an analogous construction. They too have an insulator surrounding the cells that carry the signals. The Schwannoma is a benign (i.e. non-malignant or non-cancerous) growth on these insulator cells. It is not a growth on the nerve cells themselves. The growth is an extremely slow growth. I am told it is about 1 mm per year. Early in 2005, my left ear felt clogged up, like there was fluid in the left ear. You know the feeling, you have it coming out of a swimming pool or shower. The feeling of being clogged up did not go away. Then while I was away in a hotel room, using my watch as an alarm, my right ear was pressed against the pillow and my left ear was free. I could not hear the watch alarm at all. At this point I went to my general practitioner. He first checked to see if there was any blockage on the external side of the ear drum. There was not. He then performed a couple of simple tests that showed conduction, not nerve hearing loss. He put me on a decongestant. When that did not work, my GP punted and I went to an Ear Nose and Throat specialist. At the ENT's office, more extensive testing was done which showed that I had hearing loss on both the low frequency end (which is attributed to conduction) and high frequency (which is attributed to nerve damage). As he asked me questions about when and how the hearing lost began, I apparently was not giving him "good" answers, so he ordered an MRI. This brought out the real diagnosis. At this point I started searching the web to find out where to go to get this treated. I ended up at Stanford. Next to the 7th nerve is the 8th or Acoustic nerve. Schwannoma's on this nerve are much more common, and the treatment plan for the 7th nerve is based on an assumption that the physiology of the Schwannoma's are the same. The 7th nerve Schwannoma is so rare that the medical community just does not have statistics on it. A table of all of the Cranial nerves can be found here. 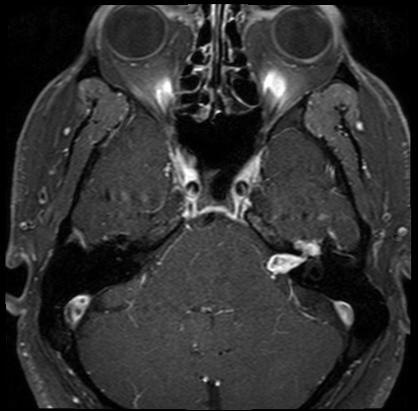 The Schwannoma is seen in light gray on a diagonal going from the center of the image to the lower right. This sketch shows the Acoustic (Hearing), Balance and Facial nerve. On the brain side of the hearing canal, they are all bunched up together. On this sketch, Dr. Jackler has drawn in where the Schwannoma is located. The radiologist's report says that the growth extends inwards to a region called the Geniculate Ganglion. I believe in talking with the doctors, that at the present time, the growth does not hit this region. Continuing with my simplified electrical engineer's view of the nervous system, if the brain it self is the central processor, the Intel, AMD, or PowerPC chip, the Geniculate Ganglion (GG) is either a smaller processor attached to the brain where a number of the Cranial Nerves come in and get processed / merged before going to the brain itself or if you know what a ribbon cable is, it is the point that the ribbons come together before going to the brain. I know that if the growth has not hit the GG, then a splice can be done. I am not sure if a splice can be done with today's technology if the growth has hit the GG itself. Unfortunately there is no "good" course of action today. There is no Star Trek doctor with a magic gizmo to waive over me and treat the Schwannoma. If I were in my 80's, this is probably what I would do. The growth will happen slowly, leading to increased loss of hearing as it crushes the neighboring 8th or Acoustic Nerve, as well as a palsy on the left side of my face. In fact the palsy has begun with an intermittent tremor in my lower left eyelid. Thinking about it, this tremor has been with me longer than the loss of hearing, but I did not do anything about it as I did not think it was symptomatic of anything major. After the palsy, when the growth crushes and kills the facial nerve, then I would get paralysis on the left side of my face. I don't know what further complications would arise as the growth puts pressure on the GG or on the brain itself. I also don't know if the growth could go on inside the GG. But since I am not in my 80's and I know that the growth is active (based on the recent loss of hearing), this is not an option. Radiation, with either the Gamma Knife or Cyber Knife. In both cases, beams of radiation are delivered along many different angles, all intersecting at the desired target. Each beam by itself should do minimal damage, but where they all intersect, the dose is now high enough to damage the targeted areas. To me, this course of treatment will be successful if the growth is slowed down or even stopped. The best outcome would be an actual shrinkage of the growth. It is possible that the treatment will fail completely. It is also a finite possibility that 7 to 10 years down the road the growth could turn malignant. There have been 8 cases cited in the literature. These were all Acoustic Neuromas. All were fatal. In the case of the Gamma Knife, this is done with Gamma Ray emission from the decay of Cobalt 60. CO60's main decay path has a half life of 5.271 years. There are over 200 sources that are aimed along different paths to intersect at the tumor. CO60 gives off 2 gamma rays when it decays. One at an energy of 1.173 MeV and one at 1.332 MeV. Data from here. It is not clear to me if the Gamma Knife uses both or if it has a filter to only use one. A description of the Gamma Knife can be found here (on page 18) as well as here or many other sources. Based on what I understand of this technology, the head is bolted into a frame and is not allowed to move at all. This apparently is very uncomfortable, and as a result, they do not deliver the dose in multiple sessions, but is done in one day. Delivering the dose is multiple sessions is called "fractionation". This is the first revision of this paragraph after my treatment now that I know more. There will be a medical physicist as part of the team that treats me. I will be asking this person the questions I have outlined in the above paragraph. You can see a presentation by my Radiologist, Dr. Iris Gibbs, here. In any case, this machine has advantages and disadvantages over the Gamma Knife. Its main advantage to a patient is that there is no bolting the head to an immovable frame. Day 1 of the treatment protocol at Stanford is to put a mesh or grid over your head. This will mold to your head. Then a CT Scan (cat scan) is done. 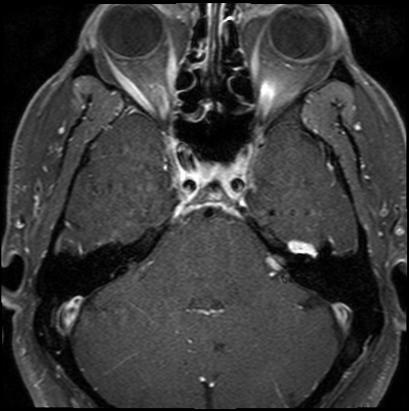 Both the Schwannoma and the grid are visible to the scan. Day 2 is an off day. Day 3 through 5, you are put into a room with the CyberKnife, with the grid on your head. The machine is continuously imaging the grid with soft x rays (this is the one disadvantage) and dynamically adjusting for head movement. The head is allowed to move up to 2mm. After that, the software prevents the beam from firing. I would think another advantage of this when the research is done, is to see if there is a wavelength more harmful to the growth than to either normal schwann cells (the insulating cells) or the nerve cells themselves. Since the radiation is derived from a Linear Accelerator, one has many more possibilities for output wavelength than one would with a radioactive decay. Mother Nature only allows a describe and finite set of wavelengths from decay. This treatment option is not very attractive, and is a last resort. Basically the area of the nerve under the Schwannoma is removed, and a nerve from another part of the body is spliced in. For 12 to 24 months there will be total paralysis on the left side of my face. During this time, measures have to be taken to make sure that the left eyelids blink to supply tears to the eye. This is done with some sort of mechanical spring mechanism. Eventually healing does take place, and some level of facial movement is restored. However the medical community tells me that on a scale of 0 to 6, I will be at a level 3 for facial movement. I don't know if this scale is linear or not. I also will probably go totally deaf in the left ear. The game plan therefore is to have some regular monitoring after the CyberKnife procedure, and make sure that the growth is not getting too close to the GG. I think based on my conversations with the doctors that if this happens, then surgery is indicated. Hopefully this is a long way off. I went out to Stanford the week of August 29 to Sept. 2, 2005. Please click to this page for a discussion. I went back out to Stanford for another MRI on Feb. 18, 2006 and an appointment with Dr. Jackler on Feb 21. Dr.Gibbs was out of town and I was not able to see her at this time. I went back out to Stanford for another MRI on October 16, 2006 and an appointment with Dr. Gibbs on October 16, and Dr. Jackler on October 17. I gathered all of my MRI's and took measurements of the size of the Schwannoma. I decided this year to put a page together that shows clips like the one above with all of the mri images through the years. That can be found here.